If you have a fungal infection in your toenails, there is no better time to treat it than winter. 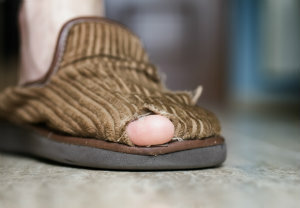 For one thing, your feet are probably covered more frequently so nobody will be able to see the fungus. For another, you are less likely to be getting pedicures or wearing toenail polish, so your nails can heal faster. So get started now (because it can take a few months to completely clear up) and your nails will be summer ready before you know it! Fungal infections in the toenails exhibit a few common symptoms. Your nails may become discolored (yellow or black) and may become thickened or more brittle than your healthy nails. You may notice that there is a foul odor or even a discharge coming from infected nails. In some cases you may even experience pain or discomfort, but this isn’t always present with toenail fungus. However, if you do notice any of these symptoms it’s very important to get to a podiatrist for an exam as quickly as possible. The longer you let the infection fester, the worse things can get. It can spread to other parts of your foot or body and become very difficult to get rid of. Treating fungal nails usually starts out conservatively with topical creams, polishes, and antifungal medications that can be taken orally. If these fail you may consider doing laser therapy, which targets only the fungus and leaves any healthy tissue unharmed. Sometimes this still isn’t enough, and in extreme cases you might need to have your nail surgically removed. This is very rare, and always used as a last resort, because it can take up to a year for a new nail to grow back, and you are at risk of developing other infections in the meantime. For answers to more of your questions regarding treating a fungal nail infection please call Dr. Viedra Elison at (623) 584-5556 to schedule an appointment. Together, the staff at Fixing Feet Institute in Surprise, AZ can help you fight this problem, so you can get your healthy toenails back ready for the summer.